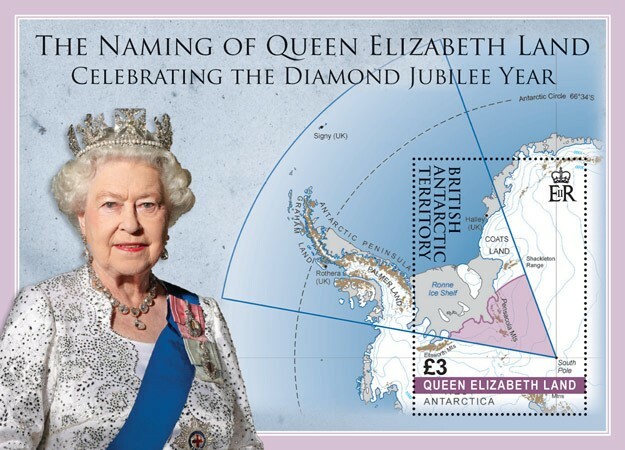 Antarctica issues new Queen Elizabeth Land Stamps – just in the nick of time! When William Hague announced that part of British Antarctica would be renamed ‘Queen Elizabeth Land’ in honour of Her Majesty’s Diamond Jubilee, little did he know it would be the start of a race against time for one of the world’s smallest and most remote postal administrations! The gesture put this tiny island in the South Pole – one of the UK’s 14 British overseas territories – back on the map. For the British Antarctic Post Office, the opportunity to issue new commemorative stamps was not to be missed even though it presented some very big challenges! Following the Foreign Secretary’s announcement on 18th December 2012, in order to issue the new Queen Elizabeth Land stamps before October 2013, they had to be designed, approved, printed and on board the last ship from the Falklands to Antarctica by 7th March. That gave them just 79 days! It was going to be tight, but soon enough, stamp designs were submitted and approved by the relevant authorities, including the Queen herself, and the presses started rolling. Hot off the press, the first stamps were quickly taken to RAF Northolt to be airlifted to Port Stanley on the Falklands where the ship was waiting. It had been a close shave but on 18th March, the new stamps arrived on Antarctica, ready to be affixed and postmarked, along with 495 exclusive First Day Covers which had also made the long journey south. 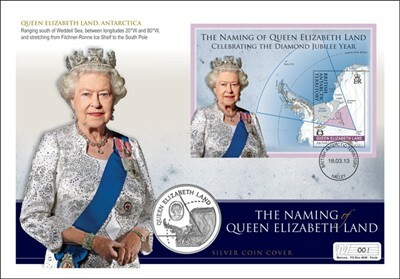 The Queen Elizabeth Land Commemorative Silver Coin Cover was later completed with a new silver proof crown, issued by the island’s Government also in celebration of the new name.